The Food Alphabet and More: Got to love Angry Puffs! A day in the life of a foodie. We all have our cravings for food, there's chicken, beef, pork oh and there's chicken again, hahaha! 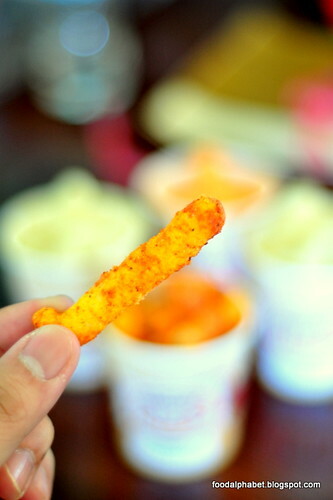 Yet in spite of all the food in the world, nothing compares to our cravings for chips, and well in this case puffs! Angry Puffs! No one can stop me from having my daily share of my favorite chips and puffs, well maybe wifey, but absolutely no one. I believe some of you guys can even relate to me, like when its already late at night, wifey sleeping then we get a bag of chips from our stack, and munch away like there's no tomorrow, well until wifey wakes up of course. 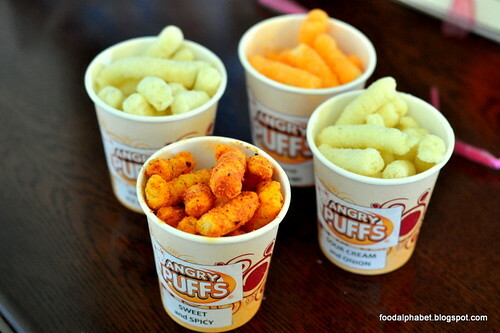 A good friend of ours Fran, gave us a treat by handing out Angry Puffs sampler cups for us to munch on, during our weekend getaway at Taal Vista Hotel. Wow! From the looks of it, I'm going to be extra happier today (look at my superlatives haha). But really from the sight of these Angry Puffs, I know I will having a grand time munching on this. Angry Puffs are air-baked not fried, well that is reason enough for me to make that extra excuse to finish it all off in one seating, wouldn't you agree wifey? Haha. Always made fresh, Angry Puffs makes for the perfect movie companion, the friend that you need when you're all alone, or better yet your long lost brother. For whenever you take a bite, it never fails to bring a smile to your face. 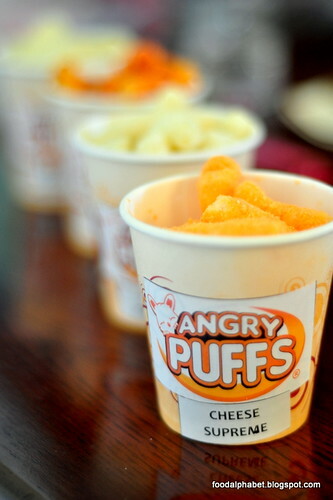 Enjoy your Angry Puffs in 9 flavors: Cheese Supreme, Sour Cream, Sweet and Spicy, Hickory BBQ, Chocolate, Buko Pandan, Chicharon, Cotton Candy and Vanilla. Served in the following sizes: small (P35), medium (P50), large (P120) or party tub (P200). You can avail of their promo of P100 for 3 small tubs. My favorite so far? Hickory BBQ. 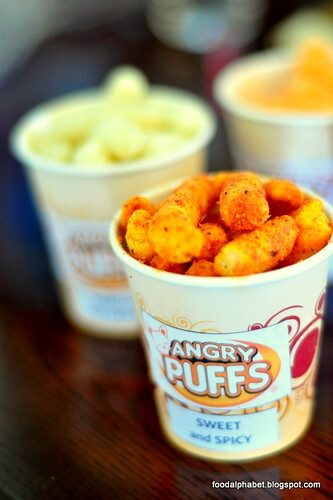 Angry Puffs is available at the Midnight Mercato on Saturdays from 9:30 pm to 3:00 am at Bonifacio Global City. For inquiries, you may reach them at 0928-5025014.